"CAVES" at Silverlake Art Co.
WHERE: The Silverlake Art Co. 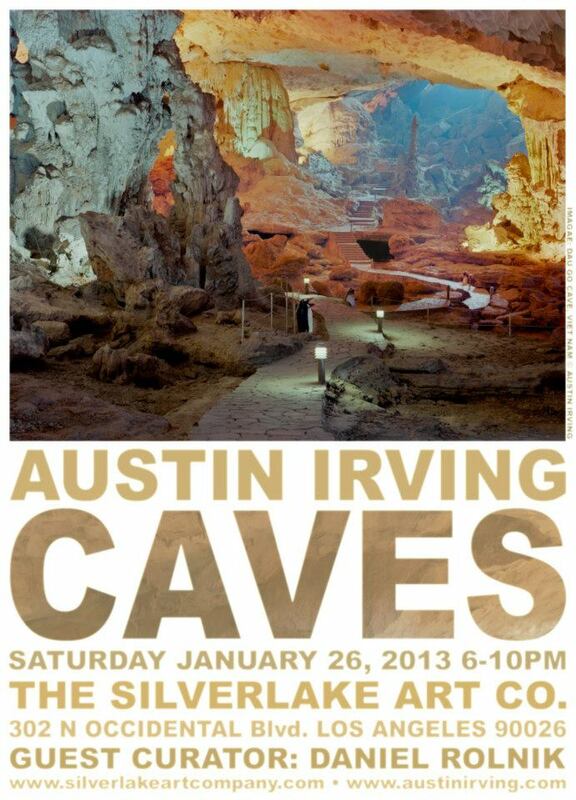 I met the artist Austin Irving through Anne Faith Nicholls, who had had an exhibition of her work at Curio. We became friends and one day she invited me to meet her for coffee at groundworks in Hollywood, CA and we brainstormed an idea for a show. I thought it would be cool if she displayed her photos of caves, but made it feel like you were actually inside a cave when you looked at them. A little while later, I got an email from her asking if I could be the curator of a show she was putting on at The Silverlake Art co. I agreed and then showed up and like magic, there it was, an exhibit of her photos that felt like you were in the cave. It was epic! Every time I see Austin I always tell her how it was the best lighting I've ever seen in an exhibition. She had set up all these epic stage lights to transform the space from a white walled gallery environment into a show cave. The show was only up for a night and then ran through a weekend I believe. It was hosted at The Silverlake Art Co., which was America Martin's painting studio that she would occasionally transform into a space for plays and exhibitions. This was an epic show.